There's a better way to see Hearst Castle than the typical day tours when the immense house feels like a museum. Guides lead big groups of visitors past lifeless surroundings and talk about their history. They're so busy that they may not even wait for everyone to catch up before starting their spiel. Don't despair. There's a better way to see the Hearst Castle: go on a more intimate night tour. Groups are smaller. Warm lighting and docents in 1930s costumes bring the huge house alive. You'll feel like you stepped into a party that Mr. Hearst just left. Women sipping martinis over their card game. Reporters type their days' stories in their bedrooms. Lovers stroll the grounds hand in hand. It's easy to pretend that you just arrived at "the ranch" where Hearst lived and entertained with his long-time girlfriend, actress Marion Davies. Their guests included Hollywood stars, politicians and dignitaries such as Charlie Chaplin, Clark Gable, Greta Garbo, Charles Lindbergh and Winston Churchill. One of my favorite things to think about is sitting on the edge of the pool next to a handsome movie star while servants bring martinis, but you can concoct your own fantasy. To enjoy all that, you have to go at the right time of year That would be Friday and Saturday evenings in the spring and fall — or most days from mid-November through the end of the year. You can find the current night tour schedule on the Hearst Castle website. 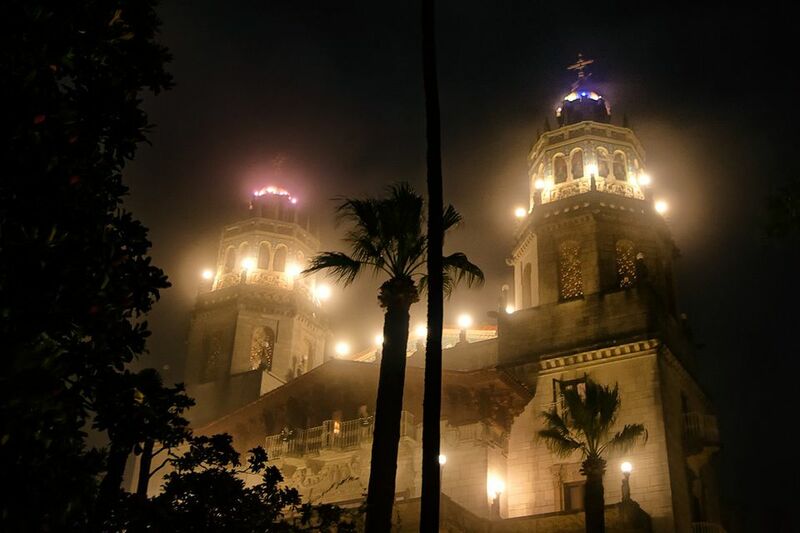 The Hearst Castle Night Tour lasts a little more than two hours. That includes the round trip bus ride from the Visitor Center. It covers many of the same locations as the daylight tours including the indoor and outdoor swimming pools, the largest guest house, living areas, kitchen, and Hearst's private quarters. Extras for the Night Tour include a 1930s newsreel. From mid-November until just after New Year's Day, night tours are held more frequently. The Holiday Twilight Tours give you a chance to see the place decorated for Christmas, with an 18-foot-tall Christmas tree and lots of twinkling lights. Hearst Castle Night Tours are held in spring and fall. Holiday Twilight Tours happen from mid-November through January 2). You can reserve tickets online at through Reserve California, as much as two months in advance. It takes a lot of patience to work with their system, but this may help. Use the Find Tours box on the upper left corner instead of using an Enter Date button for a tour. If the tour is sold out on the date you select, you can get a "next available" option. You may find it less frustrating to call them at 1-800-444-7275. Taking the Night Tour is highly recommended, but you may also want to see the Castle in daylight (recommended for the views). The night tour includes highlights from the Experience, Upper Floors of Casa Grande, and Garden tours. Your best bet is to choose a tour that explores something different. Allow time to see the Building the Dream film at the Hearst Castle Theater before you visit the Castle for a better understanding of why and how it was built. The film is not included in the evening tour price, but they offer discounted tickets to night tour guests.